NOTHGARD - official video clip released for "The Sinner's Sake"
German Melodic Death Metal heroes NOTHGARD whose upcoming new studio album "The Sinner's Sake"will be released on September 23rd, proudly present the official video clip for the title track today. "Finally it’s done! The last video is unleashed. What a heavy spring and summer… But it was worth it. This video is the visual fulfillment of our titletrack “The Sinner’s Sake”. I am more than happy because this is no common performance video. This is real art and again it was done by Motion Bakery. Thanks again for your great job! We love it and I am sure our fans will love it, too. Nothing more to say, except the fact that I am more than happy, that our new album will be released in just two days – on September 23rd and it’s gonna be killer! Make sure to check it out." In support of this upcoming release, the band will tour Europe to present the new material to the fans! Together with German epic metal pioneers EQUILIBRIUM, Dutch folk metallers HEIDEVOLK and German Black Forest Metallers FINSTERFORST. Founded in late 2008 by singer and lead-guitarist Dom R. Crey, the band stands out due to technical guitars, epic orchestral elements and intoxicating live shows. With their two releases, Warhorns of Midgard (2011) and Age of Pandora (2014), NOTHGARD have already got a large following. Their blend of melodic death metal with the mentioned epic elements and further influences out of Neo-Classic and Folk have quickly made them a favorite with fans and critics alike. SUICIDAL ANGELS - playthrough video of "Eternally to Suffer"
The new album of Greek thrash metal tank SUICIDAL ANGELS, "Division Of Blood", was released on May 27th via NoiseArt Records. Today, the band presents a playthrough video of the track "Eternally to Suffer"
Last week, the band released the animated video Clip of the song "Image Of The Serpent". The clip was created by students at RMIT University in Melbourne, Australia as part of the Bachelor of Design (Animation & Interactive Media) program. Producers Aaron McLoughlin & Simon Norton spent around 3000 working hours with their team to create the Video. 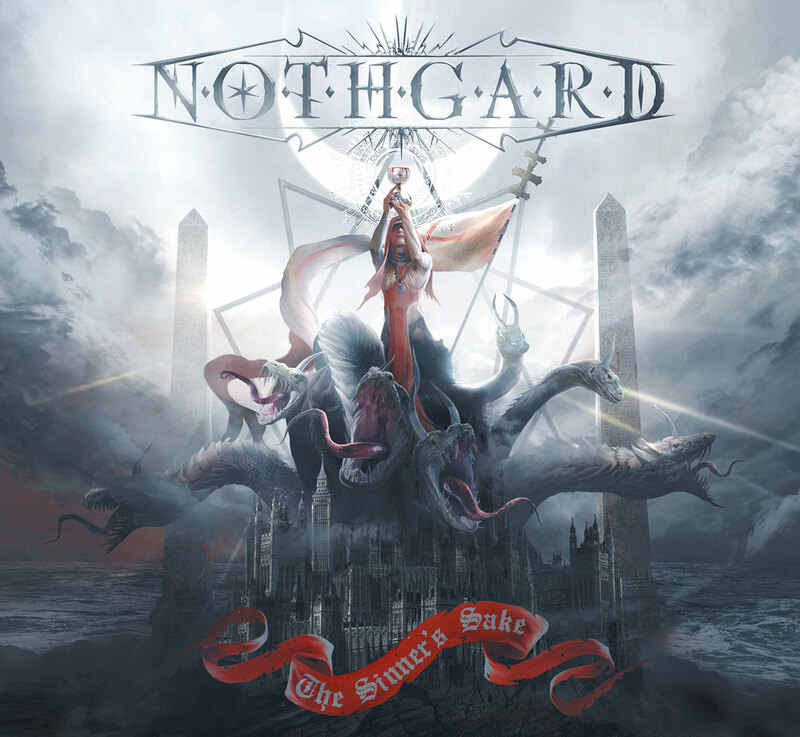 The wait is finally over and today sees the long awaited release of "The Sinner's Sake" the new studio album from German melodic death metal heroes NOTHGARD via NoiseArt Records! "Melodic death metal with powerful epic guitar riffs - a strong album"
„The Sinner’s Sake“ is a big step to the metal olymp!" “Great riffing with powerful vocals and enough melodic elements to make the band very interesting! Two days ago, the band released the official video of the title track. In support of this release, the band will tour Europe to present the new material to the fans! Together with German epic metal pioneers EQUILIBRIUM, Dutch folk metallers HEIDEVOLK and German Black Forest Metallers FINSTERFORST. TROLLFEST to release new album "Helluva" on February 24th, 2017! Norwegian Balkan metallers TROLLFEST pleased to announce the release of a new album on February 24th, 2017 via NoiseArt Records. The seventh studio is entitled “Helluva” and it promises to be a helluva album. 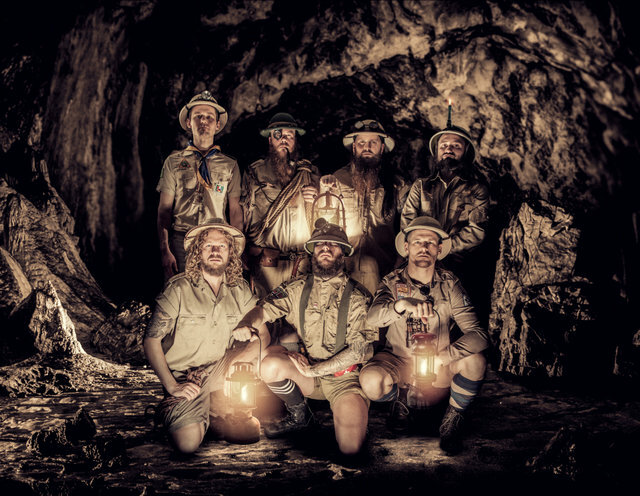 The Trolls once more bring their mix of extreme metal and balkan influences to a new level with an added Brass section, combined with more Kaos! "Out of Kaos, into more Kaos! We have been holding this close to our hearts for some time now, but finally, oh finally, the sweet release is upon us! Our new album is here! To our joy and satisfaction, it will be released February 24th, 2017! We call this beautiful baby HELLUVA, and she is the result of many long months of demoing, arranging, recording, re-recording, cutting, compressing, computing and confusing, laughing and loathing, singing and screaming, spitting and sneering. The pride we have for this album is unfathomable, and we are so happy to finally share it with all our lovable fans! Like the perfect omelette, we also busted quite a few eggs (braincells and bloodvessels) during this conception. So even though we still produce a helluva mess in the kitchen, the meals we make are always tasty to the EXTREME! So here we stand at the brink of the coming release, shivering with anticipation, ravenous for road rage and trembling with tenacity! HELLUVA comes with a 100% "Knock-your-socks-off guarantee", that is a promise! LET'S GO!!!" TROLLFEST have been proving that they are able to hold their liqueur for over 12 years. “Helluva” is helluva party, animated by exceptionally gifted people, and it is not only a lot of fun, but it lives up to the highest musical standards. The vocals that are sung in the band's own “Trollspråk” (“Troll's Language”) are as diverse as TROLLFEST's instrumental madness, and it is just as skillful – elating, catchy, and perfect to babble along even after two, three, or 20 drinks. Bottoms up, the TROLLFEST is coming nearer, and it demands a high-percentage sacrifice! 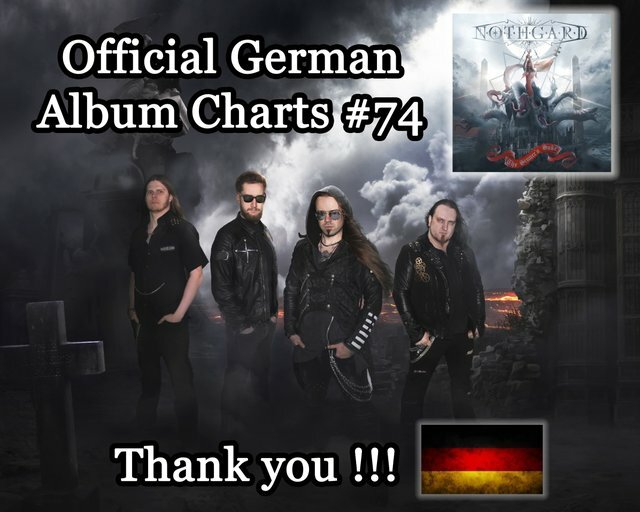 NoiseArt Records is proud to announce that the new album of German melodic death metal band NOTHGARD“The Sinner's Sake” entered the official German charts on #74.
album charts. "The Sinner's Sake" reached #74! For us it feels like #1 and we are so proud, happy and grateful for your support! We would like to thank all our fans, followers and supporters! You've made it possible! "